Bahrain’s beauty lies in the shallow waters that lap its coastline. The word ‘Bahrain’ is derived from the Arabic for ‘Two Seas’ and historically its wealth came from the trade in the pearls that grew in the many offshore springs. 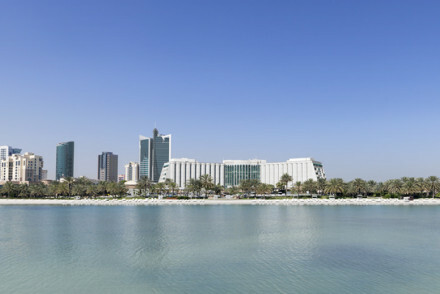 The island interior is a little underdeveloped, which is why the best places to stay in Bahrain are on the coastline or in the cosmopolitan capital Manama. They are mainly luxury destinations with state of the art spas, palatial suites, and enormous lagoon-style swimming pools that emulate its crystal shores. The hub of Bahrain's activity is Manama, where business visitors from around the world congregate and most of the best hotels in Bahrain are centred here too. Manama has a skyscraper-spiked skyline, World Trade Centre, a wealth of night clubs, white sand beaches and reclaimed land being built on to cater for the very wealthy. Like Dubai and Abu Dabi, Bahrain has its share of glitz and glamour, though Bahrain has a much more liberal social climate; women can dress as they please and alcohol is completely legal. Venture out of the urban sprawl and enjoy the world-class watersports and diving around the Coral Reef on the West Coast at Sitra. Or if you're more of a wildlife enthusiast, visit the Al Areen Nature reserve. Visit Sakhir, home of the ultra-prestigious Bahrain Grand Prix, attracting fans from all over the world. The Hotel Guru's selection of the best places to stay in Bahrain are mainly Five Star resorts located in Manama, Sitra, or Sakhir. Like Dubai, Bahrain lives up to its wealthy reputation. However, not all of it is surface deep, and the historical and sporting attractions around the island are its modern day pearls. The Ritz-Carlton Bahrain Hotel & Spa - fabulous spa, beautiful suites, lagoon-style swimming pool, and direct access to the beach. Sofitel Bahrain Zallaq Thalassa Sea & Spa - chic suites with four poster beds, sea water spa, an award-winning Italian seafood restaurant. Kempinski Grand & Ixir Hotel Bahrain City Centre - romantic private dining pods, a choice of Italian or Arabian cuisine, and the Royal Suite is a stunning penthouse apartment. 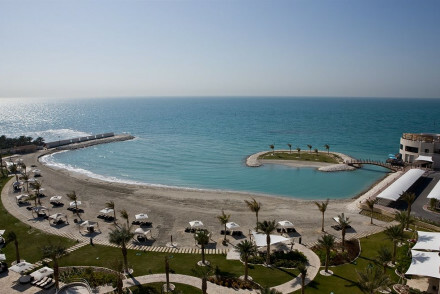 Al Areen Palace & Spa - Bahrain’s first villa-style hotel with an excellent spa and next to the Al Areen Nature Reserve. Majestic Arjaan by Rotana – Manama - the newly built suites have 1, 2, or 3 bedrooms, and it's only 2km from the International Airport. Al Bander Hotel and Resort features luxury cabanas situated on a peninsula plus a pristine white sand beach, enormous lagoon-style swimming pool, and plenty of diving, sailing or waterskiing. The Gulf Hotel Bahrain - this predominantly business traveller hotel also caters to leisure travellers with its enormous swimming pool, tennis and squash courts. Also it's a 15 minute drive from the main shopping areas and famous restaurant area Adliya. The Domain - a hip hotel where the emphasis is on socialising - it describes itself as a ‘socially charged members club’. Fine dining restaurants serve Italian, Lebanese, French cuisine and lively bars host social events. If you'd prefer your own space, then visit our online partner Booking.com for a wide range of apartments and suites across both the urban centres and the coast. Fly to Bahrain International Airport, situated a convenient 9.2km (5.7 miles) away from the bustling Manama area. Best time to go: November to March. Summer temperatures can rocket as high as 50 degrees between May and September. Best to avoid: Muslim holidays. Eid and Ramadan; there’s an influx of Saudi tourists who take up every room. Or expand your search to include all our recommendations in Abu Dhabi or Dubai. Please feel free to contact a friendly guru for advice. 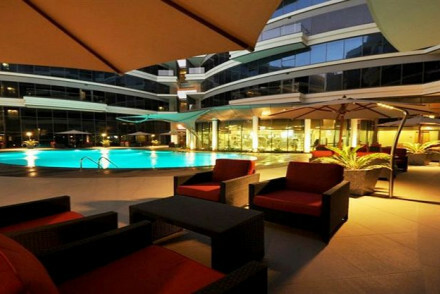 A good four star apartment hotel ideal for families or long term visitors. Contemporary classic suites have up to three bedrooms, kitchens, and dining rooms. Swimming pool and health club. Good value too. Families - Luxury apartments sleep up to 6. Sights nearby - Bahrain National Theater, Bahrain National Museum, and Al Muharraq Stadium. 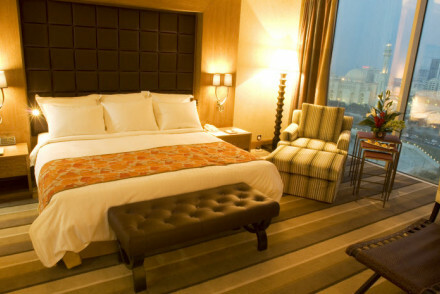 Bahrain's original Five Star hotel with rooms, suites, and serviced apartments. Enormous lagoon-style swimming pool, excellent business facilities, spa, and multiple restaurants. A great choice for families, groups of friends, and business visitors. Great value for money. Families - Three bedroom serviced apartments. 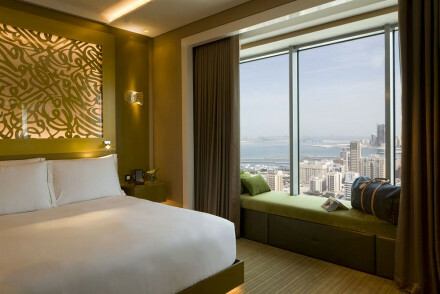 A great hotel with simple contemporary rooms in Manama. Contemporary classic interiors are filled with clean lines and creamy furnishings. Lovely pool, garden, health club and restaurant. Excellent value, understated, refreshingly simple. Sights nearby - Al Fateh Mosque, Bahrain National Theater, and Khamis Mosque. A large Five Star hotel with all the facilities in central Manama. Huge modern rooms and suites with chic furnishings and state of the art technology. Excellent choice of restaurants, extensive spa, and close to lots of attractions. Ideal for business or leisure and very family friendly. Spa - Pure Spa offers holistic treatments with organic ingredients. A stunning Five Star hotel members only club/boutique hotel. Stunning contemporary rooms and suites with unrivalled views and all the mod cons. Fine dining restaurants, state of the art spa, and designer chic living spaces. A grown-up spot for the luxury traveller. Foodies - Three fine dining restaurants. Luxury resort hotel overlooking the Arabian Gulf with the only Thalassa spa in the region. Romantic bedrooms combine french style with Arabic influences. Huge swimming pool, tennis courts and water sports galore. Ideal for an active beach break or a spot of spa pampering. A Five Star hotel in the central Manama but on its own private island. Tranquil gardens, day loungers, outdoor restaurants. Romantic rooms and suites & villas in contemporary classic style have private balconies and all the mod cons. Excellent spa and multiple cuisines. Completely luxurious. An Arabian villa-style Five Star hotel close to the Al Areen Nature Reserve. Romantic rooms and suites have delicate furnishings, marble floors, high ceilings, and all the mod cons. Fantastic restaurants, state of the art spa, and enormous swimming pools. A luxury spot for couples and families. A fantastic resort on the beach front. Cabana-style rooms, suites, and family suites situated on a private marina. 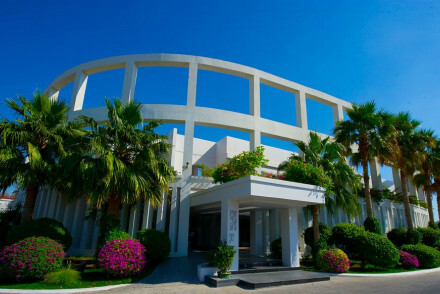 Direct access to the beach and many water sports, kids club, many pools, spa, and multiple restaurants. Ideal for families and sports enthusiasts. Sights nearby - Riffa Fort, University of Bahrain and Bahrain National Museum.